I admit that I’ve been working on this one for a while. Sorry for the lack of updates, but I have been far too busy doing everything last minute and fixing bugs to post here! 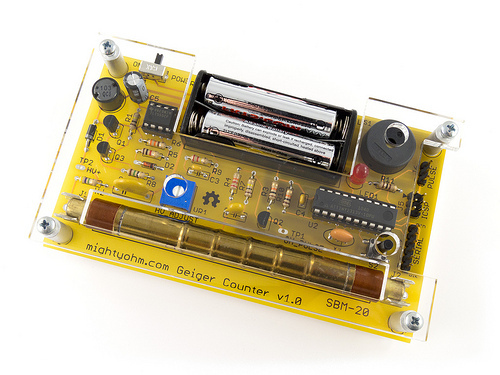 I designed this Geiger Counter kit specifically so I could give a workshop at Chaos Communication Camp 2011. I just couldn’t fly halfway around the world only to show up at a hacker conference empty-handed! My workshops are tentatively scheduled for Thursday and Saturday. I’m not bringing very many kits, so if you’re coming to Camp, sign up early! More information about the kit is here. I’ll be adding more documentation over the next couple weeks. 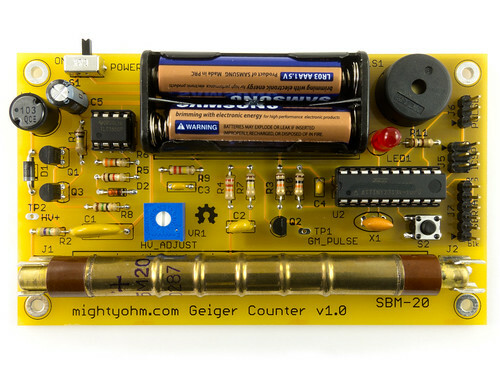 Hopefully I’ll also be showing off this kit next month at the OSHW Summit and the NY Maker Faire. also note: Radon gas is heavier than air. place counter on floor of lowest part of a dwelling in which air remains mostly undisturbed. typical indoor concentrations of radon gas represents about 48 Bq/m^3 (roughly 48 CPS). Natural background radiation is about 26 Bq/m^3 (roughly 0.09 to 0.13 uSv/h or 26 CPS). action is recommended by WHO at 100 Bq/m^3, which corresponds with the EPA recommendation of 50 to 123 Bq/m^3. Is there way to specifically monitor radon with this or focus to it? Looking at ways to better monitor radon and trends vs my monitors. Thanks in advance! That’s a good question. I’ll have to look into how commercial radon detectors work. how much you sell for whole set?